One of my Parisienne friends was in Montréal for several weeks this past summer, all the better to chat, dine, walk... and shop. You may remember Huguette, the vivacious, semi-retired, fashion-lover who favours offbeat colour combos such as the yellow/navy/mulberry skirt in the photo; her neutrals are grey and camel. This visit, Huguette had a date with a man she sees at home, but who happened to be here at the same time. 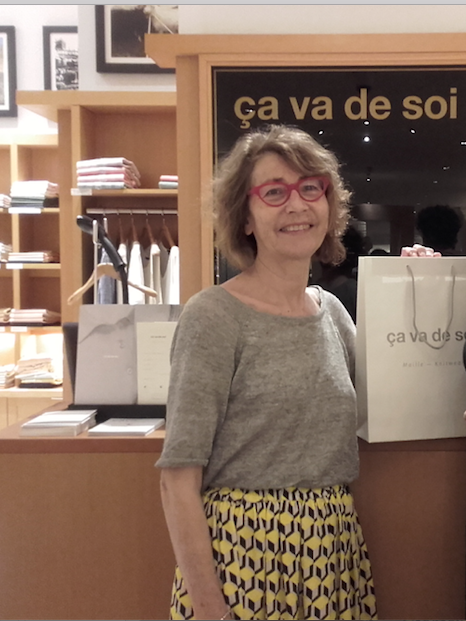 You would think she would have something in her suitcase, which was big enough to hold a tuba, but a date calls for a rethink, so we went to ça va de soi, where she bought a pale grey linen summer cardigan, the Patty. Just before she left, she bought a second, similar cardi in pastel Egyptian cotton (apricot). I wasn't sure that it offered much change from the grey, but she said mais oui, apricot is completely different. She adds colour with a bag, and is a big fan of Fossil. She was drawn to the chevron of the Rachel satchel, left, but wanted to replace her big leather Fossil tote, which she was carrying. (The thing weighs as much as a jumbo watermelon; how does she do it?) 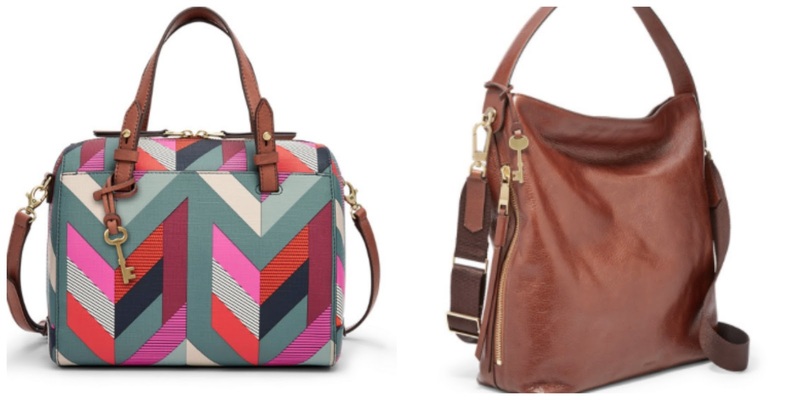 So, the Maya large hobo, right, is another contender. Between stops, I had a question. "Is it really true—because we are told ad infinitum— that French women have very small, perfectly-edited wardrobes?" "Total myth", she replied. "I did once have a friend like that, twenty-six things on the rail, only brown, grey and white. Everything went with everything else. The clothes were very expensive." She said that French women, like any, have moods: one day, it's stripes, the next, an abstract floral. In the past they bought less, but today, she said, "H&M, Zara, all that kind of thing is on every corner; their closets explode, especially the young ones." She refuses fast fashion because of disappointment with fabric. "I am having the same conversation with all my friends", she said. "We cannot believe how much good clothes cost now! And we have a very hard time finding quality. Even if we will pay for it, we can't find it." She panned COS's fabric (for the price), but praised Uniqulo for cotton tees and lightweight down outerwear. In Paris, she often shops at a small boutique which receives ends of couture fabrics and fashions then into simple skirts or tops. So French women do shop—and sometimes mightily. She said with a laugh that something about travel unleashes even more delight in finding new treasures. But her next trip is a cruise to Antarctica, where there won't be many boutiques! Interesting post! I would love to know the name of the Paris boutique that sells designer fabric ends. Great post - I love hearing how real women manage their wardrobes in France! It’s easy to fall for the myth, which I have found unattainable (and not much fun). I love those shoes! Your friend does look vivacious and she surely looked lovely in either sweater. 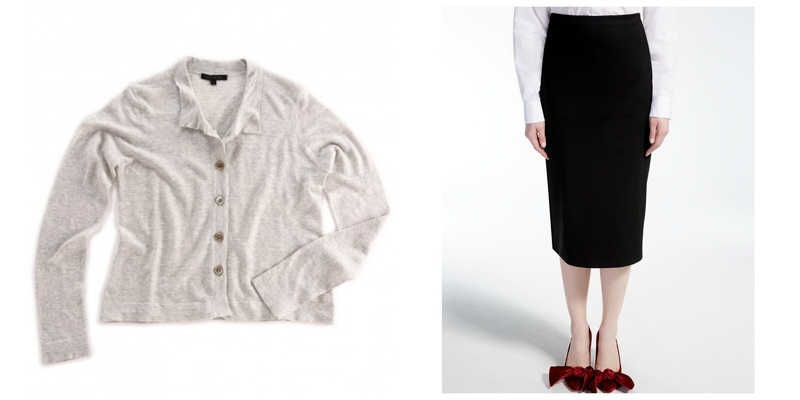 I, personally, love the shoes shown with the Max Mara pencil skirt, impractical as they are. The open oxfords are also great; wouldn't kick them out of my closet. One of the takeaways for me is the impact that cheap clothes have on our closets. It is so difficult to find quality clothing at a reasonable price. Like our parents and the generations before them I have learned to take care of the clothing, moths notwithstanding. Another thing I noticed is that Huguette didn't wear jewelry, or at least, you didn't mention it and it didn't show in the picture. Not required, and she is lovely with or without, but it is YOUR blog. I am attempting humor; please forgive if it falls flat. The moths really are a challenge though. I'm darning a merino pullover I bought last year; two little holes. As if by magic I actually discovered matching embroidery wool in a drawer of my antique sewing machine. They are terribly difficult to eradicate and my freezer compartment isn't very large (a winter béret is living there now). I was staying in a flat lent to me by a friend in Paris (who is around 40 years old) and indeed she has a lot of clothing in a small bedroom, all out in the open on a metal rack. Another friend there vwho is over 80 does conform more to the small, careful wardrobe, though she is rather more boho than the "elegant Parisienne" stereotype. Both these friends wear very little jewellery. I also love those red velvet shoes, but I'd trip over the big bows! Mercerie: Parisiennes do not reveal their "petites addresses" freely. The only way I'll get it is if we are out together and she wants to stop there. Leslie Milligan: That is why we both love ça va de soie! But woman can not live by knits alone. She does wear jewellery- if you lok closely you will see a bracelet. She usually wears a jade bangle paired with a Swarovski tennis bracelet, a 4mm gold chain (so, neither too fine or heavy), her mother's diamond ring, and small earrings. Always yellow gold. Fast fashion (H&M, Etam, Zara, Monopirx) is firmly ensconced in Paris and its influence is evident, especially among the younger generations. Where a woman my age will buy one coat for winter, a friend's daughter buys two or three. lagatta: I bought a bunch of those vacuum-seal storage bags at the Dollar Store- dirt cheap. I now keep all my woolens and silk in them in drawers. I don't vacuum-seal, it is enough to just put them in this extra barrier. It is more awkward to fish out my sweaters, but it keep them safe. I have beaten the moths way, way back. It is tempting to say "vanquished" but each time we think that, one appears. But nothing like I had. For coats that hang in a closet, I attack the closet weekly with the crevasse tool on my vacuum and keep the pherome traps up to date in there. When it gets cold you can freeze stuff on your balcony. But if you kill eggs or larvae and there are more moths breeding behind your baseboards etc. they will just re-settle on them. Never ends. Interesting, but I doubt I can heat a knit angora winter béret above 50c without harm. My merino pullover spent the entire summer in my freezer compartment. I no longer have the infestation I had, but obviously traces remain, and I do not want to live in polar fleece! At Canadian Tire this past week, I bought a series of very cheap clear plastic boxes to Kondoize my dresser drawers (and of course have discarded stuff). I hope your Parisian friend enjoyed her visit! lagatta: Roast Beret? I have not used heat but some sites say a blast of hot steam from an iron works too. Uniqlo is a fantastic source of inexpensive quality clothing!